Torn Between the G4 or S6! Any helpful information for people in the market for either of these phones? For me, it would be the G4 hands down. Screen: The colors on LCD screens just seem more natural to me. I.e. Whites are white, not yellow. AMOLED displays have a yellowish tint to them, which just looks ugly to me. I know that's subjective, but it's a big point to compete between the two. Plus, the active display models of the G4 (and M9, also LCD) everywhere I looked still had sharp, clear displays. Anything I looked at with an AMOLED display was burn-in city. You could barely read them because of how bad it is. This includes at a Verizon store with their demo modes playing. I'll only consider phones with LCD screens over AMOLED. The G4 also has sd card support and a removable battery. I like options and convenience. Plus I've been burned too many times by phones with integrated batteries. I'll never own one of them again if at all possible. It adds another failure point that could render a phone useless unless you warranty it or pay for repair. I also like being able to add a larger battery if I want. Those are my biggest points. Both phones are top of the line, both have excellent cameras, and there's plenty good that I'm sure could be said about both. So I look for the differences and try to find reasons not to buy one over the other. There isn't a perfect phone for me, and there were several phones I was looking at. It came down to finding those negatives for my tastes to decide which I would get and I've been very happy with the G4. Dustin Cumbo and Grey_girl like this. Thanks for the response! I didnt realize the G4 had an sd card slot. That can make all the difference in the world for some people! Especially people like me who downloads everything haha! Do not get an S6. Battery life is terrible. Swappable batteries FTW. G4 bro. The battery life on an S6 is terrible. Trust me I had one which I sold. The camera is great but the G4 camera from what I hear is pretty close. 100%! After the update yesterday, battery life on the Verizon G4 is absolutely outstanding. It's really a fantastic phone all around. My G4 is on standby most of the day, but still I'm at 92% after 10 hours ...maybe they just re-calibrated the battery meter . Whatever the update did to help the battery, it is amazing! 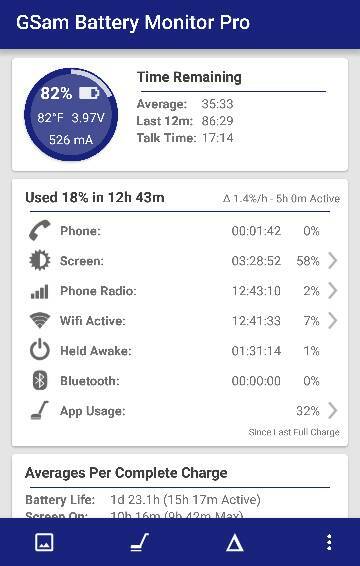 Check out these stats with my Mugen extended battery. Granted, it's double the size of the stock battery, but do the math and you'll see that even with stock battery, this thing is a great. I've had my G4 since it was released, and often question whether I should have stayed with Samsung. The lack of a removable battery on the S6 was a deal breaker for me at the time, like Mooncatt (he has really good advice in his post). However, personally I have grown to detest the button placement on the back and absence of a fixed home button on the front - I'm really tired of taking pictures of the floor or saving things from Tweetcaster when all I want to do is go back a screen or close the app. I will be more than likely going back to Samsung as soon as I can upgrade. I'll just pick up a Mophie case for when I need extra charge. I just bought a G4 online last night. Once that arrives I'll be selling my S6. I've played with the G4 alot in stores. Has certain things on it that Samsung has which I am used to which is good. Sick of Samsungs ****ty screens. It's luck of the draw getting an S6 without uneven coloiring/lighting. Honestly it will depend on if you need an SD card and better day to day battery life. S6 battery life isn't that good. Both phones have pretty poor software. Both have great cameras. Both phones have screen issues. Amoled has their issues but so does the g4 the contrast gets horrible at high back light levels. I've literally watched the colors shift as I've walked outside with auto brightness on. You will get much better performance out of the s6, Sorry but the g4 is kinda slow. With all the animations set as fast as they can go it's still slower than my iPhone 6+. Also do you want a phone that feels great and premium though slightly smaller with bad battery life. Or big and cheap ( using the leather back), with decent battery and ok performance. The G4 will never be as slow as any Sammy device and this is someone that used to have a note 2 and the rest of the family has Sammy devices. I never noticed how slow Sammy devices are until I got the G4, with the G4 being so buttery smooth at everything I through at it. This phone is the fastest and smoothest device I have ever used. That says a lot. I have both and they each have strengths and weaknesses. Short version is that you could go either way and be happy. I could. Overall size and if you have to have expandable memory are probably what would steer most people. Battery life is not terrible but very mediocre. Usage with alot of screen on time is not that bad but light to mixed use with lots of standby time is poor for a 2015 flagship. Expect 2-3% hour drop even when you aren't using it. Not smooth. Who cares what what the hardware is if you can't scroll smoothly? It stutters, even if only subtly everywhere, not just browsing. Lack of removable battery and mem card don't really bother me but might some. Crazy battery life, especially in standby. I used it for about 10 minutes of screen time, checked email a few times and let it sit for a few days. 103 hours off charger later it was still at 63%! under normal usage for me I could go at least 2 full days. Screen size makes for easy viewing and a great place to watch media content. Leather back is awesome - and removable/replaceable! SMOOTH - everywhere. Very responsive. Double-tap wake up is great. Screen is good but not great for the resolution. Off angle viewing is so so. Put the phone down on a flat surface a foot or two away from you and turn the screen on. No comparison with the S6. Power and volume buttons are not hard to get used to but I still prefer at least volume on the side. It's kinda big to put in your front pocket. Almost no way you'd want to drive with it in your pocket with pants on. Auto brightness is useless. Too dim all the time. I have it set to about 65-70% manually. They're both great. Haven't used the camera much on the LG but it seem very good as well. The only reason I wouldn't use the G4 full time is the overall size. I just prefer a smaller phone. Otherwise I would give the G4 the overall advantage all around. Really? I was afraid of that before getting mine (and got a holster case thinking I'd need it), but I can actually barely tell the phone is in my pocket. I wear mostly denim jeans that aren't exactly known for loose pockets and it fits in there just fine when naked. My holster case, on the other hand, is a freaking tank. I can still fit it in my pocket somewhat ok, but mainly because I got tired of it digging into my sides when using the belt clip. I will admit the driving aspect is simply a non-issue for me since I use a car dock. I will not discount your experience. All I can do is speak from my experience with this phone and my previous phones. After saying that I can say in my experience this phone is far from fluid. my device exhibits dropped frames missed touches and random moments of Wtf. I honestly can't speak on Samsung current version of Android since I haven't owned one of their phones since the note 3. But in my experience I would say they are both equally bad. No this phone is far from the most fluid device I have owned that title is split between the iphone 6 and oneplus one. I'm sorry but nothing about the G4 I'd bad. Let's see the notification shade is far from good( personal preference) with background activities the performance degrades quickly. Battery drops quickly if I set my location services to high accuracy( to the tune of 3 hours less usage time). Dropped frames all over the place. Their is more but not even worth mentioning. Not saying the phone isn't good but it fails to reach the great level because of software. I'm sorry that you have all these problems. I think you should bring it back to your carrier and maybe get a replacement. I don't have any of these problems. For me, when the camera app is open, I try to swipe up from the bottom to launch the on-screen buttons. I usually do it too fast and hit the camera button instead of the center Home O. I'm just usually pointing the camera down when this happens. Does the V10 have a RGB notification LED? Single Color? Does the S6 Edge Plus have a RGB notification led? Single Color? S6 or S6 Edge for gaming? Is there any way to center the home screen? Does anyone else have issues with the charging cables for the galaxy?